Finding an attractive, comfortable baby bouncer is more or less like trying to find David Gandy on Tinder. One day you’re spending a whole week stuck between your favorite Italian restaurant and an impish trip to Bobbi Brown, and before you know it, you’re deciding which impertinently, tasteless baby bottle you despise the least. You just can’t avoid it, and before you even know, your home suddenly looks like a Disneyland shrine or a little museum for lack of a better word. But luckily for us, some brands have been caught in the fire for lack of authentic good looking baby bouncers. However, the crème de la crème have gone out of the way to develop products that are not only easy on the eye but extraordinarily convenient. A baby bouncer is an investment that any parent always dreams of. This important baby product comes in handy when it comes to providing a playing, resting or napping place for your child. Imagine having to do laundry, dishes or working for those working in an environment that allows them to bring their kids to a workplace with the baby minding their own business. Researchers have indicated that the more active a kid is at the infant stages, the less likely complications in the future. These baby products allow your kid to bounce making them active, keeps them secure and the rocking motion and toys underwrites the coherence of your baby. 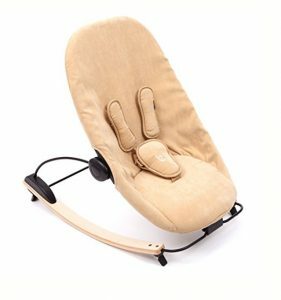 Looking for a unique soothing baby bouncer for your baby? Look no further. The sleek, contemporary, modern design makes this product heavenly. The Bababing baby bouncer comes not with one but two position backrest. 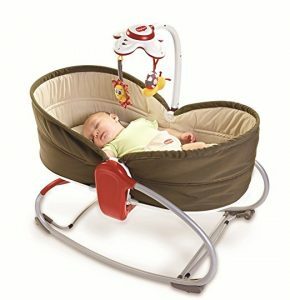 If your kid is a newborn with a frail back and neck, this beast will soothe your angel with a smooth bouncing motion. The backrest can be adjusted for an upright posture while feeding hence reducing spill-overs or even playing making the toys within reach. Needless to say, it’s outright dangerous feeding your baby in a leaning position. The patented design inspired by a leaf is aeronautical generating smooth, bouncing motion. It engages your baby’s motion allowing them to bounce at their rhythm. The 5 point harness belts underwrite the safety and position of your kid. We all know how naughty they can get when excited. This compounded with a comfortable headrest will easily trick your baby into thinking they are headed to a vacation in Malibu onboard the famous Air-force 1. If you are an anti-social mom, for God’s sake this is not for you. However, you may just have booked a straight ticket to hell where you will have a particular seat with no WI-FI and a phone charger for denying your kid a happy life. The soft toys will communicate with the little one! The funky toys say, “Hello!” How can we forget the hip colors and the washable surface? It can be wiped to restore the new sleek look. It comes fitted with two-position back rest. If the backrest is not comfortable, be ready for your child to burst their vocals. 5 point harness makes the BabaBing! Lobo 2 one of the safest baby bouncers in the market considering most of its peers are fitted with 3-point harnesses. The steel structure of the BabaBing! Lobo 2 ensures that the equipment is compact enough to withstand weights of up to 4 kg. The only possible downside is that the materials which are used to assemble the BabaBing! Lobos 2 are slimy hence causing the kid to slide around. Bounces in consonance with the baby’s rhythm. Allows your child to take a nap without holding them. The bouncer requires a peculiar juggling of buttons to prevent it from plummeting like a stone when the baby sleeps in an upright position. In totality, if you are looking for a unique, wholesome baby bouncer that is versatile, generate smooth bouncing motion BabaBing! Lobo 2 is the best deal you can ever get. We choose to name Chicco Balloon as the bouncer of choice on a day when no amount of breastfeeding works. Thanks to an inbuilt interactive computer game, your baby’s moment of relaxation will totally make them feel comfortable as if you were cuddling them. As if that is not enough, the sounds and soothing lullabies will keep them entertained. The genius does not stop there. You can record a 30 second audio of yourself for you to keep that bond with your baby. For those seeking to redefine versatility, then this is where to get inspiration. Chicco Balloon Baby bouncer can double as both a bouncer and a seat. For kids of up to 6 months, it’s ideal to be used as a bouncer, and then after that, you can transform it into a seat. The backrest can be adjusted to suit the position where your baby is comfortable. You can also kick into a rocking mode when the dreary mood sets in. When not in use, Chicco Balloon can be folded to unimaginable sizes thanks to the two unique keys. This aided by two shoulder straps makes it compact enough to travel with without looking like a NASA scientist straight from lunar exploration. The fun never ends! The manufacturer of the Chicco Balloon came up with groundbreaking vibration technology function which soothes your baby without compromising on comfort. They will be sleeping it off while you read your favorite book. This supplied with a comfortable ergonomic booster cushion ensures maximum comfort. Non-slip feet which underwrite a firm grip on the floor. Adjustable backrest and removable head rest. The only possible downside is the sound keeps going off after one minute which is not enough for a sneaky cup of coffee. It is close to the ground hence emaciates a sturdier feel. The toy bar can be easily removed. You can record your voice. Fiddly straps which can be hard to adjust. It is short-lived as it ideal for kids of up to 9 months. In conclusion, the Chicco Balloon is an excellent post feed baby bouncer. It gives a serene, relaxing, and comfortable mood giving the little one an impression that you are cuddling them. Premeditated and designed by a pediatric physiotherapist, Steps Baby Bouncer is meant to lodge your baby right from birth to the early childhood stages. When your kid is upset, this bouncer knows how to calm them down by extending that smooth bounce buying yourself a little more time. In case they get older, and the bouncing is way out of control, the straps are handy firmly holding them in position once they decide to hop in for a quick cup of coffee at the neighbors. With adjustable sitting positions (four to be exact) the Steps Baby Bouncer is ready to slave whether the little one is asleep or awake. The detachable toy hanger is perhaps what sets apart this bouncer from the rest. You can hang the toys from above allowing them to play at the same time help them focus on objects. The toys can also be interchanged which in turn helps stimulate your baby even longer. You can keep vigilant anywhere with the Stokke Steps Baby Bouncer. How do you do that you may ask? It can also double as a high chair. You can clip it to a chair and place it on the dining table and enjoy your peaceful family moment. How then do you know that you have firmly clipped it? There is a green button that turns red when it is strongly in place. That’s magical right? As we all know, babies can be little messy creatures. Here is where the magic comes in, the covers can be removed and washed. After all, the holy book states cleanliness is next to Godliness. The detachable toy hanger ensures that the toys are close enough not to fall while trying to reach out to them. 5-point safety harness which makes it the Lamborghini of the baby bouncers. The only possible downside is the bouncing mechanism becomes squeaky after some time. Can be attached to a chair to bring it to height with the dining table or kitchen countertop. It is safe for your baby. The seat is not deep. The toy hanger allows the toys to hang too close to the face. In conclusion, if you want ensured fun and an interactive toys panel to entertain your baby with rich melodies, consider Steps Bouncer. Besides, safety, comfort and being able to wash make it worth its salt. Not all baby bouncers are created equal. One of the easily attractive features of the Fisher-Price Deluxe Bouncer is the soft cushion insert that creates a nest-like that comfortably cradles your baby. Kids love to be cradled close creating that warm feeling of a mom. Additionally, the plush head support can be uprooted once the baby outgrows its use. For a colicky and fussy baby, soothing lullabies and vibrations are the only two most emphatic elements. They need to feel comfortable and eventually lure them to sleep. The Fisher-Price Deluxe Bouncer incorporates this ideal feature. It comes with volume adjusting buttons which can reduce or add volume when the baby is awake or asleep. Additionally, the smooth vibrations are convenient as opposed to taking your baby for a ride on a vehicle. For safety purposes, it also comes fitted with harnesses that are adjustable keeping your darling safe and secured on the seat. The portability factor is another feature that gives the Fisher-Price Deluxe Bouncer a competitive edge over its peers. This baby bouncer is assembled in such a way that it is easy to move from one room to another. 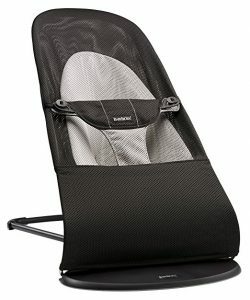 The lightweight nature offers a comfort haven and entertainment for your baby while on the go. Adjustable reclining positions that diminish back injuries. The only possible downside is that some surfaces such as the toy panel have some sharp edges that can injure your baby. Pants down, the Fisher-Price Deluxe Bouncer offer entertainment and comfort for both your baby and you as a parent. The removable toy bar little plush birdies titillates the baby’s sensory skills. The bouncing is aligned to the baby movement. It is easy to clean and wash. It is programmed in such a way that the vibrations stop along with the sound. This may distort an already gained sleeping momentum. Babies can develop a habit of failing to sleep once the vibration is not on. In conclusion, you may want a baby bouncer that grows with your child, easy to assemble without a technician and some soothing music for your kid. All these attributes are incorporated in the Fisher-Price Deluxe Bouncer which is a definite must have. The charm of the BabyBjorn Bouncer lies in the details. If all the babies would call a press conference, they can admit that there is nothing as soothing and gentle rocking. With this baby bouncer, the baby’s movements are what set the pace for the bouncer. This helps in developing motor skills. Who knows you might be bringing up tomorrows’ Olympic champion. This durable piece of baby product will go as far as two years from the birth of your baby. The harness belts can be dislodged from the jumper once the baby is big enough and you want to turn the jumper into a seat. When it gets cold, a fitting cozy cover at the seat top is used to wrap around the baby. The breathable, silky fabric will keep the angel comfy and warm. The BabyBjorn Bouncer can be adjusted to three recline positions ( play, rest, and sleep) which mean it can easily be adapted basing on the baby disposition; lying back while sleeping, upright while playing. All these adjustments can be made without a single click from the bouncer as the joints are in sync. The BabyBjorn Bouncer Balance Soft can be folded while not in use and tucked behind a sofa or a car boot. The ergonomically design keeps in mind the delicate spine of your baby as it is fitted with a reversible harness that can be interchanged to match the mood. The buck does not stop there as the base is fitted with anti-glide strips to counter the bouncer from slipping. The washable surface ensures that your baby will always look clean and smart while on the BabyBjorn Bouncer. Anti-skid pads that prevent the bouncer from sliding and damaging the floor. The only possible downside is the stiffness of the bouncer as it does not fold easily. Keeps your baby busy while you concentrate on other things. The BabyBjorn Bouncer does not require batteries. The baby movements will rock the chair. It takes quite some space so it may not be ideal for small houses. It also comes with plain colors, so if you want your baby to feel “flowery,” this may be a no-go zone. It comes at quite a steep price tag. The takeaway home is that the BabyBjorn Bouncer aids your cute little one with mental development, learn balance skills and offers physical support. Additionally, the fabric of the seat is molded in a way to protect your baby’s’ neck and back. The Tiny Love 3-in-1 is a versatile baby bouncer that hands your baby gentle movements, upright seating posture, and comfortable sitting position. The soothing vibration moods, baby music, two adorable toys, and light makes sure that your baby is entertained each day, every day, daily per day. This baby equipment also allows the baby to play independently and fall asleep naturally. This ensures that both you as the parent and the kid are untethered, calm and peaceful delivering a dose of peace and calmness. Featuring a 3- point harness, raised borders, and sufficiently padded inlay hence creating a holy napping environment. The Tiny Love 3-in-1 bouncer features an electronic toy that plays amusing music that addresses the mental development of your kid. The toys are hung using hooks that can move at a 90º angle making the toys readily available when you want to alternate them. It is also snappy and easy to assemble. The Tiny Love 3-in-1 bouncer comes with an easy to access lever where you can choose to dissect individual parts without interfering with the peace of the little one. The Tiny Love 3-in-1 Rocker grows with the kid. As a parent, it can be frustrating to buy 2 or 3 baby bouncers in the same year. However, you can remove some parts such as the harness and the headrest once the baby outgrows the baby. 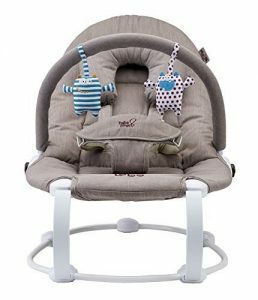 The only possible downside of the Tiny Love 3-in-1 Rocker-Napper is that it can snap into the sitting position without necessarily having being adjusted. This baby bouncer quickly mutates from seat to comfortable napper. Comes with 3 reclining positions engrossed by soothing movements. Safe napper environment indemnified by raised borders. Some people have complained about poor artistry as the fabric rips off after some time. In totality, the Tiny Love 3-in-1 Rocker-Napper makes it easy to let your little one sit, play, and nap. When they slip into slumberland, it can be easily converted into a sleeping position. It also features a fun mobile that illuminates and plays music. The Babyhome Wave bouncer is a win-win for any parent out there. It offers comfort for your baby while you admiringly watch them from a distance. Or you can even grab a cup of coffee knowing that your baby is safely strapped. These attributes have earned this bouncer a spot in the table of men. Together with three- point harness, the Babyhome Wave has two reclining positions compounded by front-to –back gentle motion reinforcing the tranquility of your baby. There is a wide variety of colors that include, sand color, orange, and graphite. 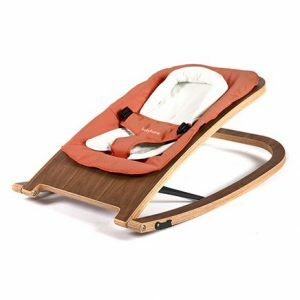 Assuming that is irrelevant, the Babyhome Wave bouncer is made from some of the most exotic pieces of timber that are laminated to give that sleek finish. The easy fold morphology also comes as a bonus. You probably have seen your next door neighbor use the Babyhome Wave and wonders how comes it doesn’t get old. The possible answer is the durable and easy to wash surface that deters aging. It is fitted with a 3-point harness that holds your baby in position. The only possible downside is the high-end nature of the Babyhome Wave as it cost quite a lot. Perfect fit for a contemporary home. It does not grow with the kid as it is ideal for kids of up t 6 months. It is quite expensive compared to its peers. Probably it’s because of the up-market mien. In totality, it is a perfect versatile baby product for your baby. It can recline in three positions which can be varied in degrees, gentle rocking, and heavily built. This will make sure you won’t have to go back to the shop when your second or third kid comes. Looking to bounce and rock your baby’s world? Look no further. The Bloom Coco Go Lounger comes fitted with a concealed 2-phase vibration unit for those days when the little ones feel frisky. If your baby feels like inviting the gods of drooling, worry not. The Bloom Coco Go Lounger comes with a removable seat pad which you wash in a washing machine. Seeing is believing but trust you me you don’t have to see it to believe it. The surface of the Bloom Coco Go Lounger is beyond soft and will leave you confused between an actual bouncer and a seamless piece of art. But perhaps the most outstanding feature is the portability. You can more than half the size once you fold it and it weighs approximately 7 pounds while folded. Safety is not an issue with the Bloom Coco Go Lounger. The 5-point harness with a one push buckle ensure even on that rough ride the kid is safely tucked. This together with an anti-skid base which ensures you find the little one on the same spot you left them is a precise definition of surpassed limits. 5- Point harness that incorporates a one push smart buckle. The only possible downside is the fact that the Bloom Coco Go Bouncer does not fold flat which makes it hard to travel with. It also looks bulky compared to other bouncers. It is too gorgeous to hide. Carries a relatively vertical price tag and will leave a considerable dent in your wallet. In totality the sumptuous leatherette seat makes it drop dead gorgeous. If you are looking to rock and entertain your baby in a deceptively simple design functional bouncer, this is for you. The Nuna LEAF Baby Bouncer aims to blow its peers out of the water. The sleek design makes it as the protagonist for the new baby bouncer era. It embodies a smooth gliding motion that is activated by a gentle push. The Nuna LEAF Baby Bouncer grows with the baby as it is possible to transform it into a baby seat once the kid overcomes the sitting stage. Additionally, the natural colors easily blend with your home décor, and it won’t look like an outcast in your living room when you have visitors. Doing chores around the house not sure whether the baby will fall is haunting, however, with the Nuna LEAF Baby Bouncer, the baby is safely and securely strapped. The fabric is outstandingly soft and of peerless cotton like quality. Don’t be surprised when your kid wakes up dreaming on having slept on a cloud. 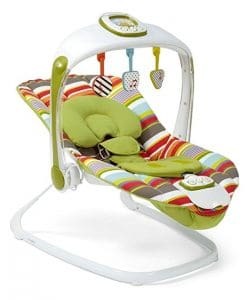 If you loathe noisy baby bouncers, then the Nuna LEAF Baby Bouncer is a perfect match for you. It gently rocks your baby without dilating any noise. The astonishment does not stop there. It does not use any batteries hence if you are living in the fast lane then you will save a lot. 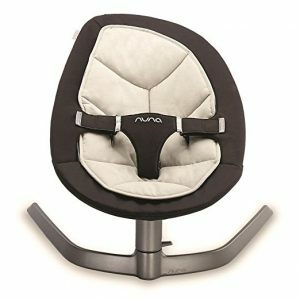 The Nuna LEAF Baby Bouncer is made of Oeko-Tex certified fabric which can be easily washed and wiped. That notwithstanding. The organic cotton insert keeps your baby comfortable and relaxed. 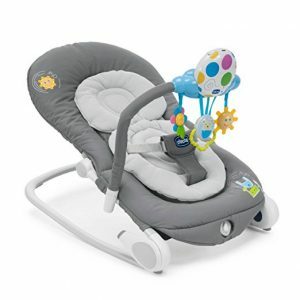 It will surprise you with three-point harness and static 30◦ recline which is sufficient for newborns to young infants. The absence of crazy flashing lights reduces visual incoherence. The only possible downside is the bulky nature of the bouncer which makes the rocking last for only 2 minutes. Smooth side to side motion that keeps your baby calm. Does not require batteries to operate. It does not play music so it can be tedious to the kid. It does not have a recline function. It is heavy hence making portability almost impossible. In totality, the Nuna LEAF Baby Bouncer is designed from a baby’s point of view. This is ideal if you are looking for a mesmerizing ride for your kid that works during playtime, mama’s chore time, and feeding time. It rocks your baby gently too. Mamas & Papas Astro Magic Bouncer is a real parent problem-solving equipment. The large seat will leave your baby feeling like they are traveling in a luxury vehicle. For the curious little ones, the seat can be elevated to a position that protracts and magnifies the world around them. The magic happens when the bouncer allows you to connect your iPod to it leaving you to deejay for your kid. The groundbreaking movement option allows the baby to enjoy gentle bounce or soothing vibration which has been programmed to imitate a mother’s heartbeat. This aggravated by an interactive kick pad that creates magical pattern cascade ensures that your baby develops the leg muscles. It is also fitted with protection harness, a head support that can be detached and soft fabrics that can be washed for extra softness, and comfort. It is fitted with a harness that secures your baby in place. A detachable head rest protecting your baby’s head. Incorporates a soft seat that indemnifies the backbone. The only possible downside is it has some weak adjustment which can make it snap making it dangerous when not properly adjusted. It has an excellent kick pad. Magic card technology that does not require short interval reset for your baby to stay entertained. It ‘s hard to assemble. It can snap and sink. In conclusion, it is portable and can be effortlessly moved from room-to-room. That notwithstanding, It can be elevated to a high position allowing the baby to feel part of the family. The magic continues with a detachable head rest, and a safety harness making it the ultimate baby bouncer. Settling for as baby bouncer can be a daunting wave to ride. A quick internet search will bombard you with a cohort of baby bouncers some of whom manufacturers are not known. However, we want to streamline your search. Firstly you want to consider the ability and age of your baby. You don’t want to waste time and money buying a baby bouncer only to realize that your baby’s back and neck are too fickle to match the bouncer. Alternatively, a little bouncer for a large baby would turn out to be ridiculous. You don’t want your child laughing at you for misfiring their weight or age. A good baby bouncer requires a minimum of 3 point harness straps to keep your baby from falling. An even better one should have over-the-shoulder straps. Baby bouncer manufacturers have gone out of their way to innovate and come up with a baby product that glides side to side, vibrate or even rock taking into consideration the baby kicks. A good baby bouncer should be gentle enough not to hurt your kid’s legs. We must agree in unison that when a baby is young, they can get out of control. The spit-up, drools and diapers overflow are imminent. A good baby bouncer should come with a removable cover so that it can be washed. A nicely padded seat underwrites a comfortable sleep and rest for your kid. You may also want to consider a baby bouncer that assumes several positions or can be converted into a seat. How you are going to store and transport the baby bouncer is another factor you should consider while purchasing a baby bouncer. A good baby bouncer should keep in mind of how convenient is it to fold it and travel with it without looking or feeling bulky. A good number of baby bouncers is battery powered. However, unless you are ready to part with unlimited spending on batteries, consider looking for one with a plug in. Much as all the baby bouncers present compelling lineups, we had to separate the boys from the men using the most pressing parameters the editor felt most compelling. A baby is the best gift for every parent. However, a kid comes with a myriad of challenges (We are not saying that you give up your kid for adoption) such as maternity leave that may leave you with no stable income. 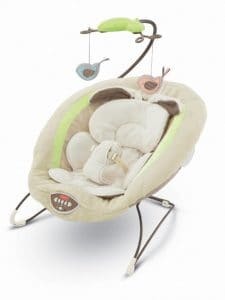 That notwithstanding, the Tiny Love 3-in-1 Rocker-Napper is the ideal baby bouncer when you are living in the fast lane and are seeking to reign in on your spending without foregoing the little pleasure that a bouncer gives to your baby. It holds almost the same attributes with the rest of its peers, and so we don’t think it is wise to buy a luxurious bouncer whereas you can still get the same services without having to spend a fortune. The BabyHome Wave bouncer has officially won over our team when it comes to the fancy aspect. Simply put, it is the Rolls Royce of baby bouncers or even the Mecca of baby bouncers. We are talking about equilibrium between what appears to be a primeval piece of furniture made in the 21 Century way. Fashioned from high-quality laminated timber, the Baby Wave looks like it was inspired by chaise lounge. Being fancy without being versatile would mean nothing. 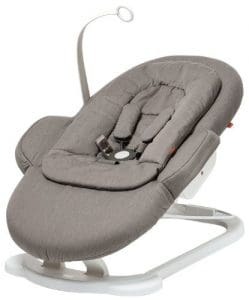 However, the BabyHome Wave can be adjusted in 3 reclining positions and front to back gentle motion that makes the experience heavenly for your baby. Although it does not come cheaply, all these positive attributes make the spending worthwhile. Truth be told, a baby bouncer is a baby bouncer…right? However, there are cushy ones, sleek ones, some with toys and some without. The bottom line is that they do serve the same standard purposes. It is a portable seat to keep your baby occupied, a napper or an outright entertainment spa for your baby. All opinions expressed are entirely our own assessment (both practically and on book), and trust us we would never endorse a baby bouncer unless we truly and emphatically love it.